When IBM introduced the System/360 on April 7,1964, it was named after the number of degrees in a circle. It encompassed every need of every user. Contrary to what many might think, IBM System/360 was born in New York, Hudson bay and not in the Silicon Valley. The System/360 was the first to use SLT micro-circuitry. Moreover, it paved the way for the world renown Customer Information Control System(CICS). CICS began to be used extensively for Online Transaction Processing. ATM Transactions, flight reservation systems all began using CICS. 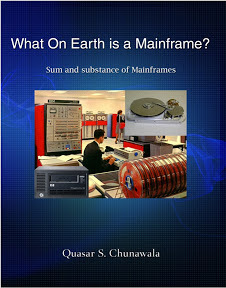 This brought the Mainframes out of the Machine room, and it began to be exploited commercially by many users. It allowed the companies to store and retrieve business data at their workplace. Today, most of the transactions of the world are handled by CICS. System/360 also featured the first Database System IMS(Hierarchical Database Management System) which was used in the Apollo 11 mission, which put the man on the moon. It also set the scene for IMS's DB2 software later. I believe and maintain, that IBM Mainframes have always continued to evolved. They were the firsts to introduce the concept of virtualization – the notion of a virtual machine. IBM Mainframes have a huge cache memory and high performance memory systems that can be shared between many users. Mainframes have intrinsic ability to prevent memory leaks. You are reminded of this, every time you see a Blue Screen of Death on the Microsoft Windows PC. In the year 1979, IBM also introduced the Universal Product code, which later came to be used as the Bar Code printed on all products sold in Retail Stores. Using this technology, it became easy to store information about a product name, description, its price and manufacturer and all other details at one centralised place, and could be accessed from any POS terminal. In the 90s, IBM introduced System 390 which smashed the 1000 MIPS landmark and set a new record in computing power. Today, the z10 series server have attained record speeds of 30,000 MIPS.